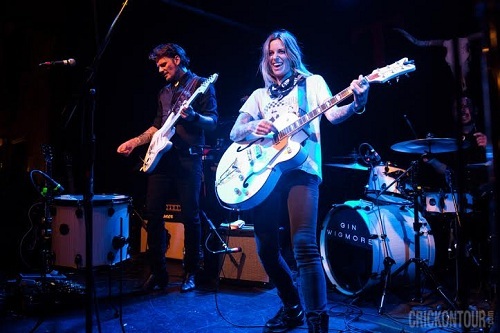 Screaming for an audience, Gin Wigmore embodied late heroines Janis Joplin and Amy Winehouse as she captivated the Tractor Tavern on September 19. The New Zealand native has a touch of country influence chopped together with a bluesy grit. I use the word “grit” because Wigmore has an independence and strength in her lyrics and a raspy voice that sounds like it blossomed in Muscle Shoals but withered in the desert and became an oasis for folk-pop melodies. Playing a sold out show at the very strange time of 6:30 p.m., Wigmore was as captivating of a performer as I have seen. Not overly dynamic on stage, nor overly extravagant, she won over the crowd with a cynical charm that showed through in her demeanor and lyrics. Singing in front of a full band I was concerned that Wigmore’s voice would either drown out the instruments or be drowned out by the instruments, but it wasn’t a problem: the control Wigmore has over her voice is fantastic. She can raise the volume without losing tone and her dynamic vocals leave no room for anything to overpower what she has to say. I was a tad disappointed she didn’t play her most pop-electronica sounding song, “In My Way,” which reaches into waters where artists like Kimbra like to swim, but I was not disappointed by any of the songs she did perform. Wigmore’s a huge voice that screams for larger audiences.